When Jobbik’s leader, Gabor Vona, visited London on Sunday 26 January 2014, he was rightly greeted by a Unite Against Fascism protest and a howl of derision from the press and media. For Hungary’s Jobbik is an unashamedly racist and fascist organisation. Like all previous fascist parties Jobbik has a twin track strategy for winning support. It has an electoral wing, which has delivered three MEPs and 47 MPs to the Hungarian parliament. It also has a paramilitary wing, the Magyar Gárda (Hungarian Guard). These black shirted thugs intimidate its opponents and carry out vicious attacks on Hungary’s Roma community . Jobbik is Europe’s biggest fascist party. Like Golden Dawn in Greece it has not gone down the Euro-fascist route of cultivating a “respectable” image adopted by the Front National in France or the British National Party. Instead it has shown itself as a nakedly fascist and racist party. To my knowledge there is not a single book published in English outlining Jobbik’s history, practice and ideological beliefs. This short article addresses these questions. Jobbik, the Movement for a Better Hungary (Jobbik Magyarországért mozgalom) was formed in 2003 by a small group of nationalistic and religious university students. Its political breakthrough came three years later, when between the 17 September and 23 October 2006 a wave of protests and riots shook the Hungarian government and state to its core. This protest movement was triggered by the release of a private speech made by the then Hungarian prime minister Ferenc Gyurcsány. In his speech, he revealed that his Socialist Party (the equivalent of Labour Party in Britain) had lied to win the 2006 election and had achieved nothing in its four years of office. The protest movement was the first the country had seen since 1989. It took a nationalistic form: there was a re-emergence of deep seated anti-Soviet Russia feeling, and many of those protestors felt that the Hungarian government was still in the pockets of the Russian state. By February 2007 the movement had petered out, but it had shifted Hungarian politics to the right. So much so that Fidesz (the Hungarian Civic Union), now the governing party, has moved away from being a liberal anti-communist party (as it was in the 1990s) to being a hard right-wing conservative party today – something akin to UKIP. Jobbik capitalised on this rise of nationalist sentiment and anti-government bitterness. In 2007 it published its election manifesto, the Gabor Bethlen Programme, and extensively toured the country promoting it and building local and regional groups. The key argument of the programme was against what Jobbik calls the “twin ideologies” of unrestrained free market capitalism (neoliberalism) and social liberalism (multiculturalism). Instead Jobbik promotes a so-called eco-social national economy. Jobbik’s vision of Hungarian nationalism also calls for the incorporation of Hungarian minorities in other Central and Eastern European countries into an enlarged Hungarian state. •	The “Third Way” – patriotic nationalism combined with an eco-social national economy. •	Anti-Roma racism and anti-Semitism. •	Opposition to crime – which it racialises, blaming Roma and other minorities for the increase in crime. Jobbik reintroduced the term “gypsy crime” into the political discourse. Jobbik’s growth also coincided with the economic crisis that swept many parts of the world in 2008. The IMF bailed out Hungary, and as a consequence public sector workers had their wages frozen, there were stringent cuts in services, and unemployment levels reached 10% of the population and 25% for those aged 25 or under. Jobbik’s electoral breakthrough came in the 2009 European parliamentary elections where it gained 427,773 votes (14.7%) and three, MEPs. It made further gains in the Hungarian parliamentary elections in 2010 gaining 855,436 votes (16.6%) and 47 seats. Jobbik also has mayors in four Hungarian towns. It is now the country’s third biggest party. Racism is the key mobilising issue for Jobbik and plays a central role in its ideological world-view. Its main election slogan is “Hungary belongs to Hungarians” – and so the logic flows that those who are not “Hungarian” are not welcome. The European Roma Rights Centre (ERRC) reported 69 violent attacks on Roma – in which nine Roma were killed – in Hungary between January 2008 and September 2012. Jobbik and its supporters do not always wield the knife but they create the climate and encourage this horrific violence. It holds provocative rallies in Roma neighbourhoods, its supporters attack Roma property and their election material uses the term “gypsy crime”. Today there are fewer than 120,000 Jews living in Hungary, compared with 850,000 before the Holocaust. They are subjected to vile racist invective at the hands of Jobbik. During the 2009 elections Krisztina Morvai, now Jobbik’s leading MEP, infamously advised the “liberal-Bolshevik Zionists” to “start thinking of where to flee and where to hide”. Jobbik’s anti-Semitism is similar to that used in the 1930s. Jobbik claims that Hungary’s economic resources are being bought up by foreign “Jewish” businesses. Jobbik’s solution is simple: drive Jewish and multinational owned businesses out of Hungary. In open displays of power the Magyar Gárda (Hungarian Guard) marches on the streets of Hungarian towns and cities wearing black paramilitary uniforms and fascist-era armbands – an action with frightening parallels to the 1930s and 1940s. The Hungarian state banned the paramilitary squads in December 2008, but immediately they were re-established under the name the New Hungarian Guard. At a Jobbik rally in 2010, Vona stated that if elected he would wear a Gárda uniform to the first day of parliament. At the opening session he turned up in a white shirt and black vest from the banned uniform – he was never prosecuted. One example of the terror of the Magyar Gárda took place in the small town of Gyongyospata in 2011. Roma make up about 20% of the town’s population. Jobbik supporters whipped up a frenzy of anti-Roma racism, claiming one Roma family was responsible for the suicide of a so-called “Hungarian” and that the Roma community was responsible for all the crime in the area. Jobbik supporters poured into the town. 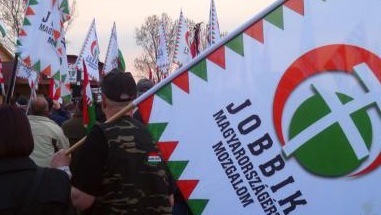 On some nights more than 2,000 Jobbik supporters demonstrated. Jobbik also set up patrols and held rallies outside the homes of Roma families. I visited the town, where the mayor is a Jobbik supporter, a year later in 2012. There I discovered that the council had segregated the school – one floor for “Hungarian nationals”, the other for Roma children. The Roma children had inferior teaching materials and were not allowed to use the school’s computers or the school’s swimming pool – it was like apartheid South Africa. Jobbik also puts a lot of emphasis on cultural and nationalistic festivals to build up its support. Often at Jobbik events you see supporters walking around in medieval garb – to the outsider it looks ludicrous, yet it is an attempt by Jobbik to link itself to a glorious era of Hungarian nationalism. Once a year it holds a Magyar Sziget festival near the village of Veroce. In the summer of 2009 I helped organise a Love Music Hate Racism carnival in Budapest. We heard reports that fascists were attacking Roma homes in and around Veroce. The media – and the British Embassy – denied the attacks were taking place. I went to the village to find out what was going on. As I drove into the village there were large numbers of skinheads wearing Nazi regalia and t-shirts. They were all coming from the Magyar Sziget festival. That year over 10,000 fascists from across Europe were present. Old Italian fascists, Hungarian Nazis, skinheads and BNP members were all mingling in the streets. I asked local villagers what had happened. Most were too scared to answer. But some were prepared to speak out and talked of the violence the Nazi festival brings with it. At the village’s main church a pastor explained that for the Roma in the village it was “a night of terror”. Gangs of skinheads ran up and down the village forcing the Roma to hide in their homes. He had personally met Roma people who had been “severely hurt”. He also told me that, on the Sunday morning while the Nazi festival was on, fascists lined up outside his church and sieg-heiled as Jobbik leader Vona, marched in to worship. A year later journalists from Jerusalem Post reported on the Nazi festival. They were greeted at the gate with Jobbik supporters carrying horse-whips and they faced a barrage of lethal threats and anti-Semitic taunts. These were no idle threats: Jobbik’s political roots go back to the Hungarian Nazi party Arrow Cross, which was formed in 1935. The Arrow Cross Party described itself as national-socialist and supported Hitler. It briefly governed Hungary towards the end of World War II. In the space of a few months Arrow Cross death squads murdered as many as 38,000 Jews, and played a role in the deportation of hundreds of thousands of Hungarian Jews to the Nazis’ death camps. Jobbik is not afraid to flirt with Arrow Cross imagery. Its supporters carry Arrow Cross flags and you often see Jobbik members wearing Arrow Cross militaria. Vona boasts that his grandfather was killed fighting alongside the Nazis on the Russian front. Jobbik is hoping to make further electoral breakthroughs in this year’s national and European elections, in April and May. Opinion polls indicate that it can expect to do well. Now more than any time since the 1930s, antiracists, the left and Roma and Jewish groups need to come together and create an independent antifascist movement.